Pen-blwyddd hapus Parthian yn 21 mlwydd oed! And how does a publisher celebrate a milestone? With a book, erm, and not just any book either. I’m lucky to have a short story in Rarebit along side Rhian Edwards, the EFG Sunday Times short story prize shortlisted Roshi Fernando, Bollinger Everyman Wodehouse Prize for Comic Fiction nominee Robert Lewis, Dylan Thomas Prize winner Rachel Trezise, Terry Hetherington Young Writer’s Award winner Joâo Morais, Media Wales People’s Prize winner Tyler Keevil, and more. I’m curious. I’ve not seen the book yet. 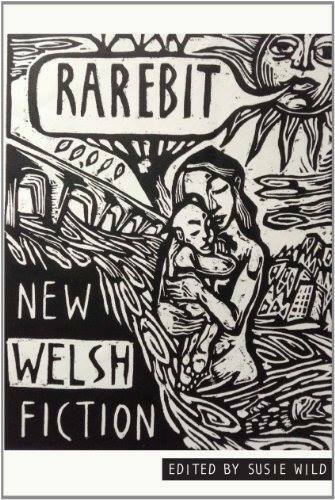 I’m told that original artwork has been created for each story by John Abell (cover artist also), winner of the Print Prize and overall runner-up at Welsh Artist of the Year 2013. I wrote about sea urchins, how they twitch when they’ve already been eaten, how they don’t know they’re sliced in half yet. About Marseilles. About revisiting places in our lives. What will John Abell have created to go along with ‘Diving for Starters’? I might let you know after the launch on National Short Story day. Shortest day of the year coming up on 21st December – yeah and the days get longer after that. Oh and you can get a book here – reprint boxes arriving tomorrow! C’est très beau. J’aime la lumière sur la couverture.